The SPEX cushion is designed to create the optimum pelvic foundation for the wheelchair user. Well established and preferred by many professionals for its capacity to adjust on-the-spot in solving for both symmetrical and asymmetrical sitting postures. 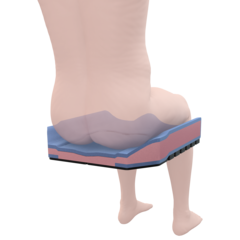 Spex cushion technology provides the key solution to positioning and levelling the pelvis correctly and effectively by strategic placement in the adjustable base cell system to further contour the cushion for correction or control. Our Spex cushions have been laboratory tested in USA for pressure characteristics. Please note that this was tested using a standard SPEX cushion without any contouring done to the positioning base. Data demonstrated that pressure readings across all five zones (L/R Trochanter, L/R Ischial Tuberosity and Sacrum) show smooth transitions without significant peaks in pressure for both test cushions. The readings indicate good pressure distribution over the entire sitting surface.